"It's the best day of the year!" If you all have been following along on my vegetarian Whole30 journey, you may have read about the hellish start I had to week two. In plain terms, I was incredibly depressed. So with a free Saturday on the horizon, I decided the best way to lift my spirits would be to treat myself to an at-home spa day! 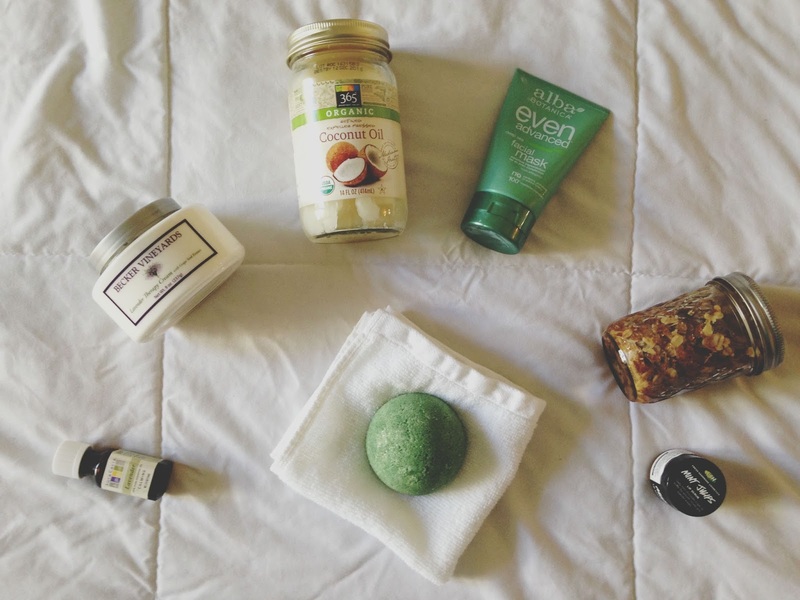 Let's walk through my guide to a great at-home DIY spa day, shall we? 1) Restorative Yoga. 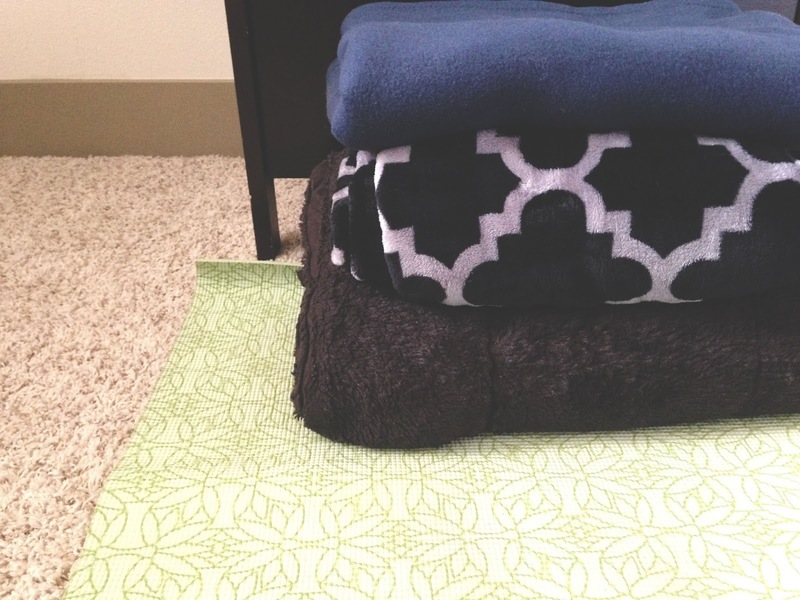 I kicked things off with an at-home restorative yoga session. If you have never done this type of yoga before, I highly recommend it. It's basically guided meditative nap time with lots of pillows and blankets and some easy stretches for a tired body. Sign me up. This is one of my go-to ones I use, which features a British lady with the most charming voice you ever heard. 2) Make spa-water. You know the lovely fruit-infused water they have at spas that gives your insides a cleansing, purifying massage? Yeah, make that. Here's the one I made, though I think I maybe did it wrong because it came out super strong (I put the lemon zest and juice into the water, and I think maybe I was just supposed to put the zested juiced rinds in? oops). No biggie though, I combined two parts lemon/mint water with one part filtered water, and voila! A lovely refreshing infused water to sip on as I spahhh'ed. 3) Set the mood with candles and music. Jon and I love candles, so we always have plenty to spare around the apartment (unrelated, Jon is really happy I just outed him and his love for candles on the internet). 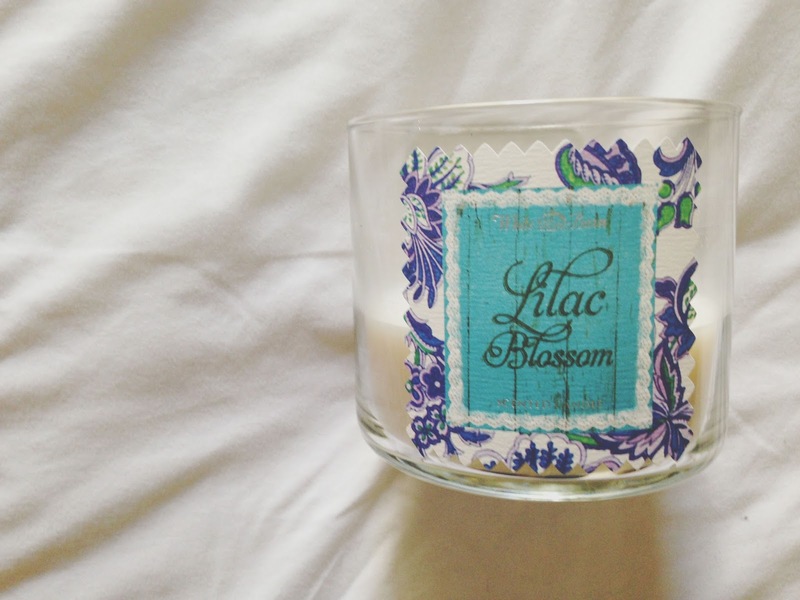 I have a lilac blossom candle I bought from Bath & Body Works in the spring that made my bedroom and bathroom spa smell amazing! Then I searched Spotify for some good spa playlists featuring pan flutes and waves and seagulls squawking and gongs and what have you. And the mood was set! 4) Give 'yo body a scrub! 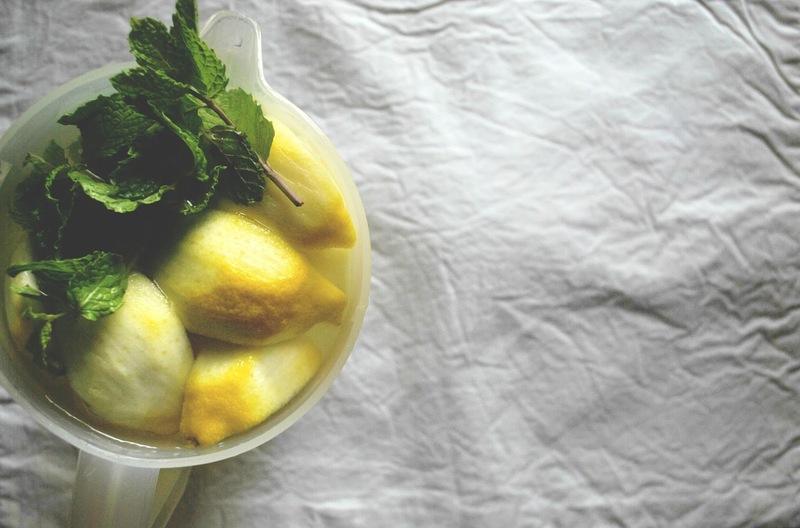 The great thing about DIY scrubs is you probably already have all of the ingredients lying around your kitchen, so they're free! This is the scrub I made, and I LOVED it. Strip on down to your birthday suit, stand over a towel (because it's super duper messy), and scrub it in using slow circular movements all over your body. I often find body scrubs to be a bit abrasive for my sensitive skin, but this was lovely. Also my dog was very interested in eating it off the floor, which I did my best to combat, so beware! 5) Inhale some lavender/turn your shower into a sauna. You're going to have to rinse off the scrub (because it really is a total mess), so why not turn your shower into a sauna? Taking on this suggestion, I got my shower hot and steamy (which only takes my shower a matter of 30 seconds, so I didn't have to waste water for 20 minutes as the article suggests), then put a few drops of lavender oil onto a microwaved washcloth. I stepped in the shower, put the washcloth over my eyes/nose, and breathed in deeply. It was seriously intoxicating. 6) Give your hair some coconut love. After I showered and dried off, I lathered heaping amounts of coconut oil into my hair to give it a deep conditioning. Then, without rinsing it out, I put it all up in a hair wrap. A regular towel will work fine here, of course, but as I had more spa things planned ahead, I found this to be a worthwhile inexpensive investment. The wrap never fell off or got in my way. I kept it on for the duration of spa day, then had to wash my hair with shampoo a couple of times at the end to get all of the oil out. 7) Mask your face. There are several DIY options out there to do a face mask, so by all means go forth and conquer! But I wasn't crazy about what I was finding online, so I just went ahead and bought Alba Even Advanced Face Mask from Sprouts. Five minutes on, and your face will be happy! 8) Splish, splash, take a bath. While my face was masking, I filled up the tub and threw in a bath bomb from Lush. Then I got in, relaxed, put some cucumbers over my eyes, removed the cucumbers from my eyes because they were annoying me, listened to some whales grunting over the sounds of a midnight tide and a silvery moon, put some tingly awesome Lush Mint Julips lip scrub on my lips, tried not to lick any of it because the ingredients are not Whole30 compliant, and just chilled the heck out. FYI Lush products aren't always cheap but I LOVE them (they're not only fabulous products, but they use natural ingredients, believe in ethical buying, have charitable funds set up, don't do animal testing, etc. ), so I always have some lying around because Jon has found their products to be good special occasion gifts. So use whatever you love/have lying around! 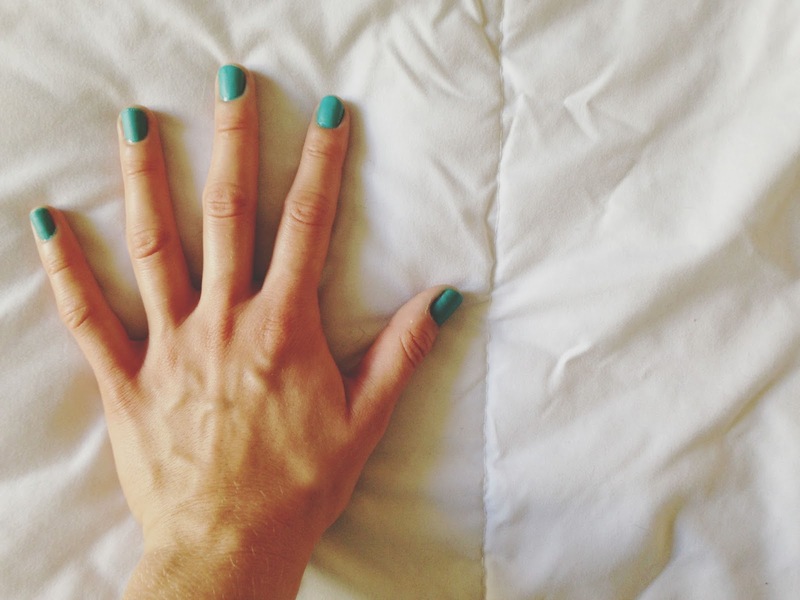 9) Give your hands and feet some much-needed TLC. Once you're done rub-dub-relaxin'-in-the-tub, towel off, put on your favorite bathrobe (I clearly went on a Target shopping spree recently and found an incredible one for $25 that I've been using every day since), put lots and LOTS of lotion on your feet and hands (I used this lavender cream from Becker Vineyards that I bought on our trip to Fredericksburg), and cover them with gloves and socks. I used these spa gloves/socks, but I think regular ones would probably work just fine. Then grab your favorite trashy mag and veg out for 30 minutes! 10) Mani/Pedi Time. I am THE WORST when it comes to manicures and pedicures. Nail salons? I can't be bothered. I go in, I absolutely cannot relax, my feet get tickled, I'm checking the time, and all I can think about is everything else that needs to be done that day. Then I invariably walk out way sooner than I should because I'm anxious about getting stuff done, and I completely mess up my nails. Does anyone else experience this? So at home is the way to go for me! First I applied some cuticle cream and pushed my cuticles out of the way a bit with some sticks (that's what you're supposed to do right? 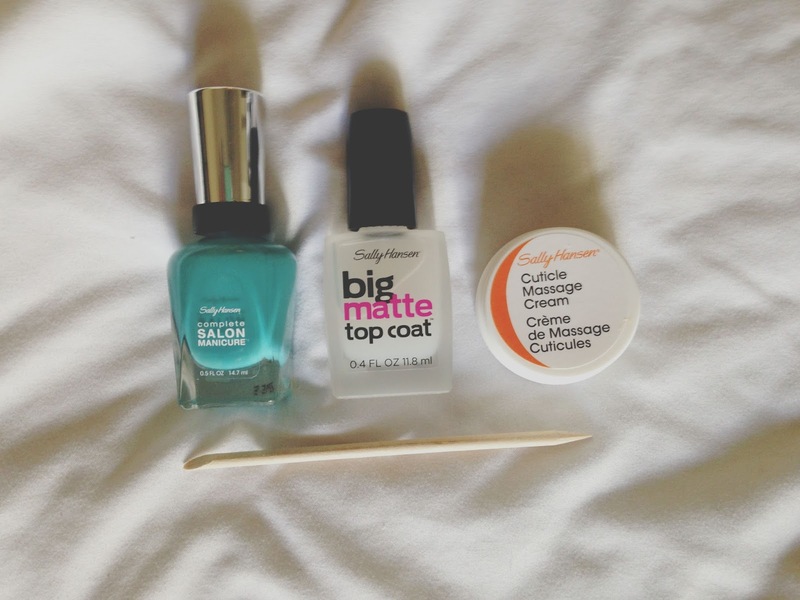 ), then applied two coats of Sally Hansen Green Light nail polish, topped off with a coat of Sally Hansen Big Matte Top Coat, which gave my nails a super cool, flat look. *None of the products mentioned in this article were endorsed by anyone. I just love them a lot and wanted to share!